Written by Janet Choi on August 23, 2017 . Have you heard of Facebook’s “7 friends in 10 days” rule? Early on in the life of the company, the Growth team discovered that a Facebook user who added 7 friends within their first 10 days in the app was far more likely to stick around for the long-term. Hitting 7 friends (in 10 days) became Facebook’s Aha! moment. The Aha! moment is the point in the user experience where your product’s value becomes clear to your users. You judge whether and how this happens on a product-by-product basis, but the end-result you’re looking for is usually conversion or long-term retention. Much of Facebook’s growth in the ensuing years came about because they were able to take that knowledge and leverage it. By devoting their efforts to bringing more new Facebook users to their Aha! moments, the Growth team grew Facebook to a billion users worldwide. 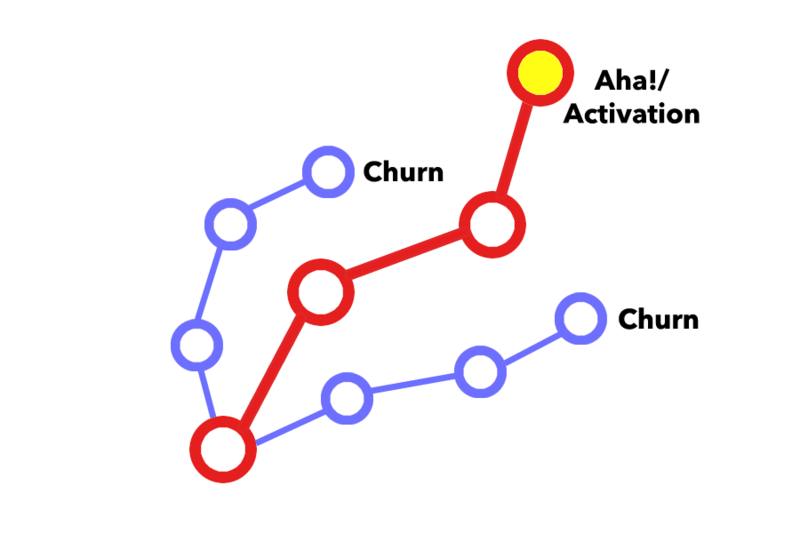 I frequently get asked what are benchmarks for retention after one day or one week….Ignore the benchmarks. Find the patterns in the stories of people who do get your product. Figure out what converted them and got them so excited to keep using your product every day or every week. People who became successful using your app or service probably did something differently from those who churned out early—if you can figure out what and why, you can start to reverse-engineer that path for your other users. The first step, of course, is figuring out what kind of behavior you want to identify as the basis of “power usage.” This sounds like a simple task (and it might be, depending on your product), but the Aha! moment isn’t always obvious, because it’s not necessarily the most-performed action or the one that seems most vital to you or even just one single moment. The action(s) that best correspond with retention might not even be around using what you consider a core product feature). You need to find the behaviors that, when performed, best correlate with continuing to use your product for an extended period of time. For Facebook, that was adding 7 friends within a user’s first 10 days using the product. The most sociable people on the platform became its “power users,” and they tended to stick around the longest as a result of their usage. If you use an analytics solution like Mixpanel, Heap, or Amplitude or use data analysis tools like Mode, you can get this kind of behavioral granularity straight away. For example, see Amplitude’s Compass feature below, which gives you a graph of all behavioral “events” in your app crossed by how well they correlate with 2nd-week retention in-app. the lighter squares, weaker Looking at the above chart, one behavior sticks out: connected social account. When performed within 2 days of signing up, it correlates with retention better than any other behavior that users can take within 2 days. That tells us that it’s worth looking at as a potential source of Aha! moments. You can also always start with good, educated guesses about power user behavior using more basic in-app analytics and through interviews with your best customers. How does power usage fit within your current product experience? Take a look at current patterns so you can work out next steps towards increasing the chance of reaching Aha! moments. One way to do this is with user research. The shoestring method involves asking your friends, family, and people you manage to cajole into trying your product at coffeeshops and cafes. Then there are sites like UserTesting, which will provide you with people to use your app plus video recordings, surveys, and reports. Make sure you give your testers a distinct list of tasks or objectives to complete. Your goal here is to put your testers through the paces of using your app, noting what parts are working as intended and which aren’t. There are also tools like FullStory that let you actually record user sessions on your site and view them later, like a customer experience DVR. It’s a painless way to understand just what your users are going through when they use your product. Of course, you can reach out to your best customers and power users to learn why and how they’re getting so much value out of your product. Your goal is to understand how people who succeed with your product get where they do. After looking at behavior data and doing user research, you should arrive at a hypothesis about an aspect of your product that would be better and help you grow faster, if it were changed. Once you have the path to an Aha! moment in your product mapped out and some ideas for how you might bring more users to it, test out some of those hypotheses. The most common way to test your hypotheses is to run an A/B test—to present two groups of users with two different versions of the same page, design, or onboarding flow. You do this while measuring some metric, usually conversion rate, and at the end of the test, you see how your different variants changed that metric. For example, if you found that people who connected their social accounts within the first few days of using your product tend to stick around longer, then you might craft an experiment around sending an onboarding email designed to get more users connecting social accounts. 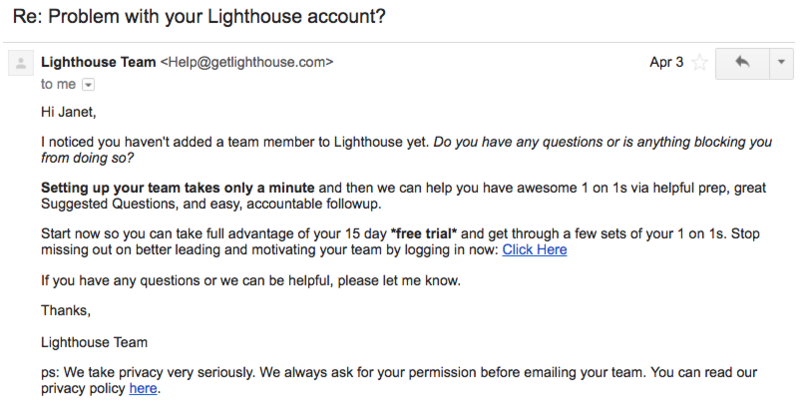 Here’s an example of this type of message: Lighthouse is a team management tool. New users need to actually add team members in Lighthouse in order to do a better job of managing them. So it makes sense to nudge anyone who hasn’t added a team member yet towards that Aha! experience. Note that you wouldn’t want to send this type email to everybody. First, segment your campaign so that only people not on the path to an Aha! moment (like anyone who hasn’t connected a social account or added a team member in the first few days, for example) receive it. Also, you can create a holdout or control group in order to compare your experiment results. (We did this with an onboarding test at Customer.io by creating an A/B test where one of the variations sent us a notification instead of sending out an email offer to a user.) The goal for your test shouldn’t be clicks or opens. Instead, you should be looking for how many users in that particular segment go on to connect their social accounts. Later, if those same people stick around with your product in larger numbers, you’ll have some strong evidence that you’re bringing more people to their Aha! moments. Your power users are your role models. Here, you’re experimenting with different approaches to bring everyone else up to their level. From Archimedes in his bathtub to Newton feeling the apple thunk thanks to gravity — Aha! moments (in our imagination) are often sudden, almost mystical moments of revelation. But the Aha! moment isn’t so otherworldly, something you just happen upon, or discover. It’s something that you cultivate through user research, understanding your product’s value, and experimentation. And as Facebook and other organizations since have shown, the power of what you can accomplish when you know it is huge. It’s your turn! Have you found your product’s Aha! moment? How did you find it?